The opening words are interesting: “You post, you text, you tweet, but why do you advertise for some car dealer every day on the street?” Apparently, Plate Talk hopes to appeal to those people who constantly bug their friends by text message, bore their family on Facebook, and tweet into cyberspace..but are still so starved for another outlet for their worthless “self-expression” that they will eagerly put rolling whiteboards on the back of their cars. These trite pieces of bumper sticker boilerplate are hardly any less mind-numbing than the car dealer advertisements this infomercial excoriates as the bane of the motorways. 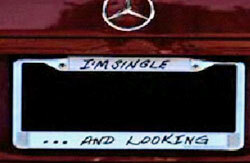 The most notable thing written on a Plate Talk in this infomercial is the message, “I’m Single…And Looking.” Frankly, you might as well scrawl, “I’m Single…Please Stalk Me!” on the back of your car. Instead host Tim Goewey implores us with the rhyming couplet, “So if you’re single and looking for a date, put it on your plate.” Then to “prove” this works, a woman pulls up beside his car and starts flirting. Your video’s not the right one, it’s the light up ball cap from an earlier post. great advertising tool. I will use it on my company vehicles to advertise the daily promotional items…..
Love how the previous post mentions Charlie Sheen, and the video from this one has a “Duh.. WINNING!” message on one of the plates. Hee hee. This product is perfect for advertising for my car dealership! And to hide the fact I bought my minivan from the guys across the street. They had donuts.